Within a home setting, getting up and down a stair case if you have mobility issues, stairlifts are used to solve the problem. However in an industrial setting, platforms or platform lifts are used. Same principle as stairlifts, different terminology. Let’s take a brief looks at some stairlifts that aren’t quite stairlifts!! Ennis Lifts provide what is referred to as a ‘dumb waiter’, used in hotel, pubs, restaurants, retail and warehouse environments. Carrying loads from 50KG to 10000KG with speeds from .45m/s to .15m/s for the largest goods lift. 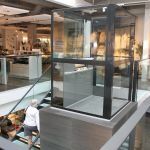 An Enclosed Platform Lift can be a really great solution to the constraints of space which is required for a conventional lift. An enclosed platform lift does not require much excavation engineering and is thus quite easy to attached to a current building in order to satisfy new accessibility legislation. As you can see from the video below, an excellent invention that has help millions of people’s mobility around the world. 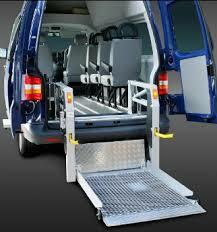 The vehicle in the photo below with the vehicle lift can be found at Dublin Airport. As you can see, lifts come in many form, Stairlifts, lifts for car mobility, goods, enclosed platform lifts and much much more. With a shortage of space predicted in the future the need for various types of lifts will only grow and grow in demand. More innovation in this sector will help shape the buildings and the needs of all in society in the future. You’d be surprised by the type of stairlifts and lifts projects that the team at BM Stairlifts have undertaken over the past two decades. If we can’t handle the job ourselves, we can recommend contractors that we can vouch for. Our number is 1890-837274 or email: info@bmstairlifts.ie.